One prominent investor thinks it's obvious that Chipotle stock is overvalued. But there's a lot more to valuation than looking at an earnings multiple. Chipotle Mexican Grill (NYSE:CMG) is one of those high-growth companies that many value investors love to hate. 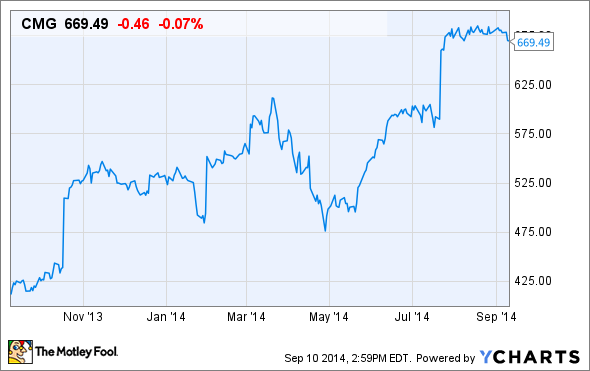 In late July, Chipotle stock rallied past $650 following a stellar Q2 earnings report. The fast-casual burrito joint now trades for about 59 times trailing earnings (and 39 times expected 2015 earnings). Many investors -- including quite a few of our Foolish readers -- think Chipotle stock isn't worth anything near its current price. They wonder, "How can a restaurant stock be worth nearly 60 times earnings?" The answer is simple: massive growth potential. Chipotle's long-term revenue growth and margin expansion prospects make it a growth investor's dream. In fact, the stock may be worth well over $700. In late 2012, hedge fund manager David Einhorn recommended shorting Chipotle based on the theory that Taco Bell was about to "eat Chipotle's lunch" with a new line of more upscale offerings. Taco Bell's campaign to steal Chipotle's customers didn't work. Last quarter, Chipotle's revenue was $1.05 billion -- up more than 50% from Q2 2012, the last quarter reported before Einhorn made his short bet. Today, most Chipotle bears don't try to argue that competition will sink Chipotle. Instead, they claim that Chipotle stock is simply too expensive. Prominent bond investor Jeff Gundlach recently declared on CNBC that he's still bearish on Chipotle for "valuation" reasons. Gundlach described Chipotle stock as "rich and getting richer." In other words, he thinks that the stock's recent gains have made it even more overvalued than it was previously. The problem with Gundlach's analysis is that he appears to look at valuation in a bubble, rather than considering it in the context of growth. This is a serious problem, because any valuation -- no matter how high -- can theoretically be justified, given enough growth. Chipotle stock is an excellent example of this phenomenon. In May 2013, Gundlach publicly recommended shorting Chipotle based on valuation if the shares reached $380 (which they did, in early July). At that time, Chipotle had trailing EPS of approximately $9.23, and was therefore trading for 41 times trailing earnings. In the 16 months since Gundlach's short call, Chipotle stock has gained more than 75% to reach $670. As a result, it now trades for 59 times earnings. In that limited sense, the stock is "rich and getting richer." However, Chipotle's earnings multiple is still within its historical range. 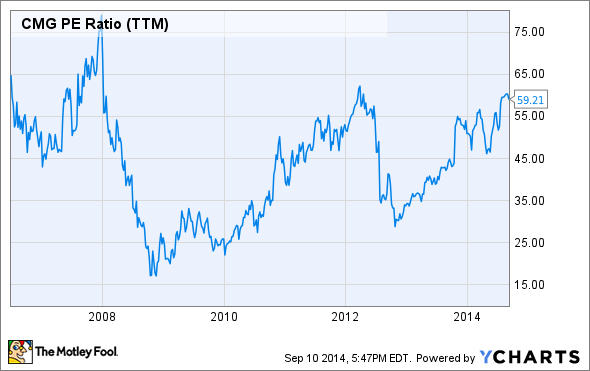 Moreover, Chipotle's earnings growth is actually accelerating. When Gundlach made his bearish call in mid-2013, Chipotle had just posted comparable restaurant sales growth of 1% for Q1 2013. Over the prior four quarters, comparable restaurant sales growth had averaged about 4.4%. By contrast, Chipotle's comparable restaurant sales grew 17.3% last quarter: the best result since Q1 2006. Over the last four quarters, Chipotle has posted double-digit comparable restaurant sales growth, and the company expects this trend to continue at least through year-end. Meanwhile, analysts expect earnings to grow more than 40% year over year in the second half of 2014. Given this acceleration in revenue and earnings growth, the increase in Chipotle's multiple seems very reasonable. Indeed, by the end of next year, Chipotle stock would need to rise above $700 just to return to its May, 2013 P/E ratio of 41. For a company growing earnings as quickly as Chipotle, a high earnings multiple can shrink dramatically over time even as the stock produces market-beating returns. The only way to know whether Chipotle stock is overvalued is to assess its long-term growth potential. As of June 30, Chipotle operated 1,681 restaurants, and it is currently adding locations at a pace of nearly 200 per year. Stellar comparable restaurant sales growth demonstrates that there is abundant demand for Chipotle's product: fresh, high-quality food at an affordable price. Indeed, anyone who has visited a Chipotle during peak hours knows that demand outstrips supply. While Chipotle is working hard to boost "throughput" and thereby serve more customers each hour, it will ultimately need to add more restaurants to even its most mature markets to fully satisfy demand. At the time of its IPO, Chipotle estimated that it could eventually operate 4,000 restaurants in the U.S. Since then, its foray into smaller, cheaper-to-operate "A-model" stores has expanded its growth potential. Chipotle's explosive growth also suggests that the ceiling could be much higher than 4,000 restaurants in the U.S.
Chipotle has also seen growing success in Canada and Europe. When Chipotle first opened in London a few years ago, it primarily catered to an American clientele. More recently, locals have started to come in increasing numbers. Chipotle's international growth opportunity could be enormous. For example, McDonald's is as American as a chain can be, yet roughly 60% of its locations are overseas. Lastly, Chipotle has experimented with new restaurant concepts in the last couple of years: ShopHouse Southeast Asian Kitchen and Pizzeria Locale. Both concepts bring a Chipotle-like experience to a new type of cuisine. Chipotle is fine-tuning the operating models for these chains, but once it perfects them, it could start to rapidly grow one or both chains. Chipotle's long-term opportunity in the U.S. could be well above the initial estimate of 4,000 restaurants: perhaps 6,000. If international stores can eventually reach 60% of the total -- as at McDonald's -- that would bring the long-term opportunity to 15,000 restaurants. If ShopHouse and Pizzeria Locale are even half as successful as Chipotle, that would represent another 15,000 restaurants of potential growth. To be clear, these are estimates of long-term potential: not anything that can be achieved in 10 or even 20 years. But eventually, Chipotle could operate tens of thousands of restaurants across the world, allowing for decades of strong growth. Meanwhile, all three concepts can continue to invest in throughput initiatives, driving long-term comparable restaurant sales growth. Growth should also help Chipotle leverage its labor, occupancy, and overhead expenses, thereby boosting its profit margin. Suppose Chipotle can grow EPS at a compound annual rate of 20% for the next decade. (That would be significantly slower than 35% compound annual EPS growth rate Chipotle has posted since its IPO in 2006.) This would drive EPS to more than $80 by 2024. At 30 times earnings -- a multiple similar to that carried by Starbucks, another large but fast-growing chain -- Chipotle stock would then be worth about $2,500. If this upside scenario comes to pass, investors buying Chipotle shares for less than $700 today are getting a huge bargain. This just goes to show that a high earnings multiple is only "too high" if the company doesn't have the growth potential to back it up. Fortunately, Chipotle appears to be near the beginning of its long-term growth trajectory. As earnings growth accelerates this fall, Chipotle shareholders can look forward to one of two good things. The stock could stay flat, rapidly returning Chipotle's earnings multiple to a more "normal" level. Alternatively, Chipotle's high multiple could remain intact: sending Chipotle stock soaring well beyond $700.